CW congratulates Brandon Schellenberger who has been named the winner of the Phil Mack Award for the Indigenous Rugby Player of the Year. Last year U.Vic’s, Crosby Stewart won the inaugural presentation. We applaud the work that Thunder Rugby and its Patron, Phil Mack, is doing for Aboriginal rugby. Philly is an outstanding player, leader and inspiration for Indigenous youth. CW is extremely proud of Schelly’s selection. In the last year, Brandon represented his country at the U20 level and has had a season plus, of Premier Rugby under his belt. He shines at any position in the backline that he may find himself posted to, relishing his ability to rise to the challenge. He excels with both offensive and defensive skills however, for this pundit, it's his creativity and huge heart that take the cake. Schelly thrives on nailing men much bigger than himself much to the joy of the Faithful and all other diminutive folk around The Park. Brandon will be honored at a presentation this coming Tuesday at 6:30 p.m. at Esquimalt High. ‘onya, Schelly, you’re da best. Whilst offering plaudits, CW offers our best wishes to Mike Holmes. Big Mike has been named to the UVic Sports Hall of Fame, (Builder’s Category). 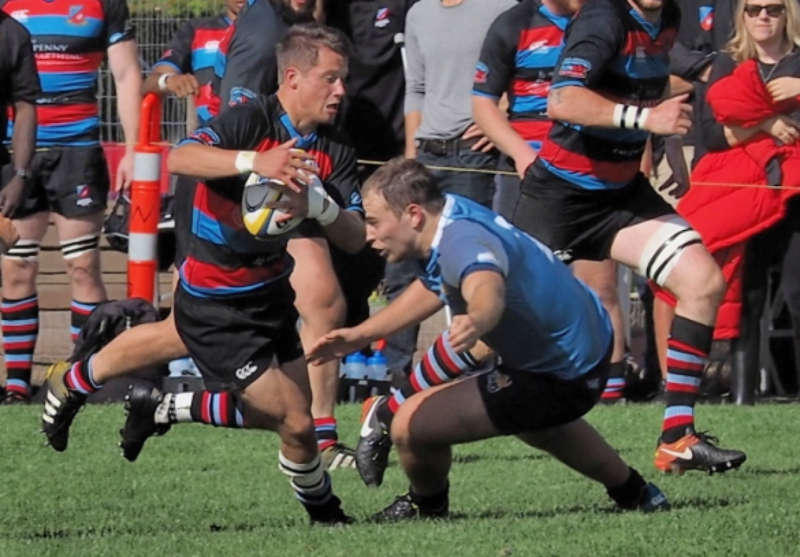 Mike has done much to support and expand UVic rugby over the years. He was a Vike, way back in 1987 and after leaving Uni and the passion he gained for rugby, he has carried this torch full circle, creating scholarships, raising funds for coaching and touring for the men and women of his Alma Mater. ‘Holmer’ also serves as an Executive Director of the Rugby Canada Foundation, a fund that has raised over two million dollars and funds many of the youth development programs in Canada, as well as forming the Canadian University Rugby Championship. He has initiated programs to make sure youth representatives can afford to play the sport of rugby. His support for the building of scholarships and an active alumni database has made him one of the most pivotal people involved in the Vikes rugby programs and a true representation of a builder. A duo of winners! Crosby Stewart and Brandon Schellenberger. Time is passing......book your table HERE.